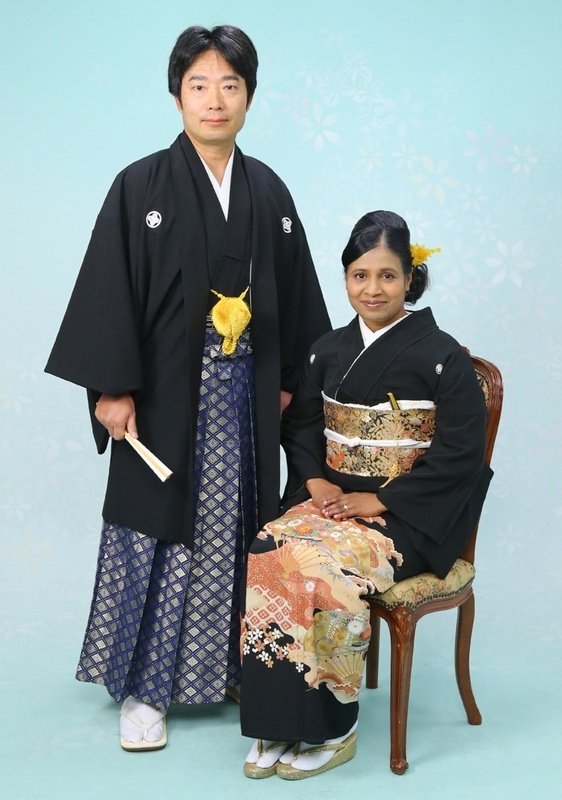 As I wrote in the post before the last one, on the morning of August 12th, hubby and I visited Amanohashidate Chionji Temple in Miyazu City of Kyoto prefecture. 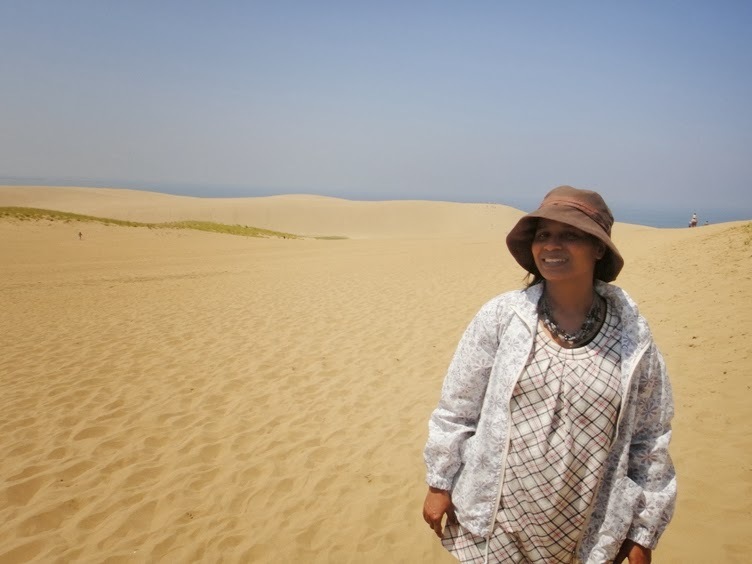 In the afternoon, we visited Tottori Sand Dunes which are the largest sand dunes in Japan. 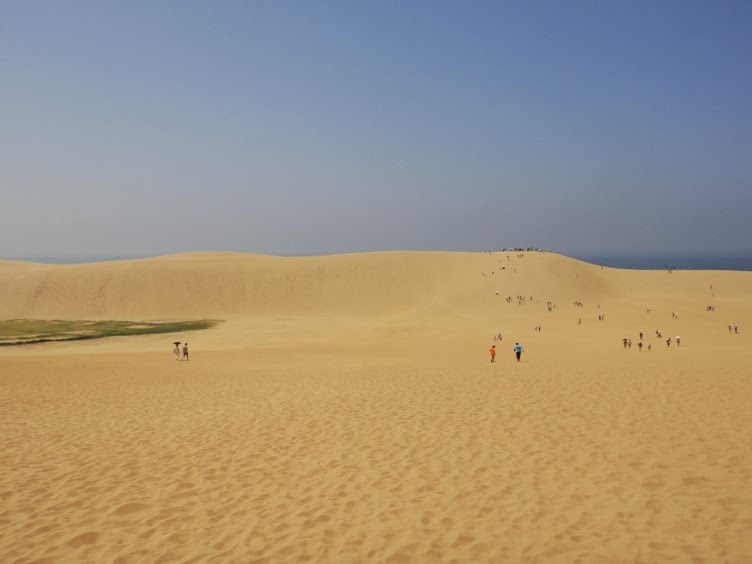 These sand dunes are breathtaking and beautiful natural formation located near Tottori City in Tottori prefecture. The dunes are actually located just outside the city center and are the most famous tourist attraction of the city. Stretching along the coast east of the city, the dunes span roughly 16 kilometers of the coast from east to west along the Sea of Japan, and are about 2.4 kilometers wide from north to south. 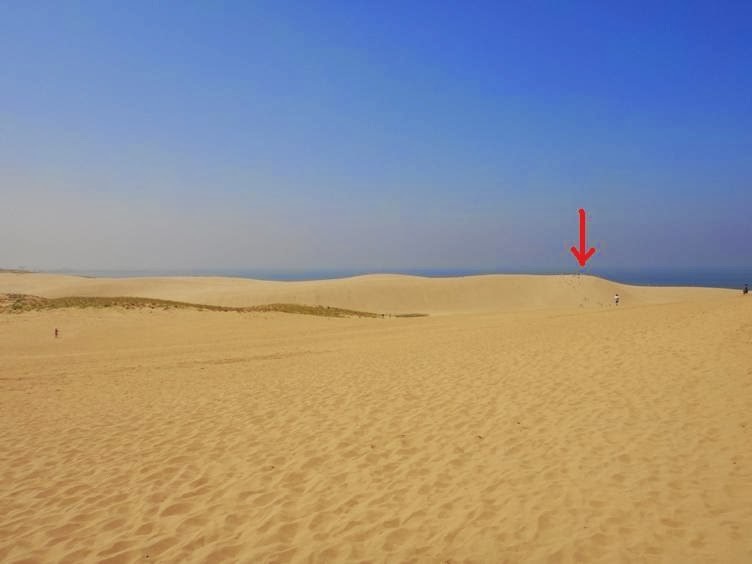 However, the main portion of the dunes is much smaller and spans only about 2 kilometers from east to west, but are still very impressive. Technically the sand dunes are not referred to as desert because the area receives a lot of rainfall, and also there is Sea of Japan adjacent to the dunes. 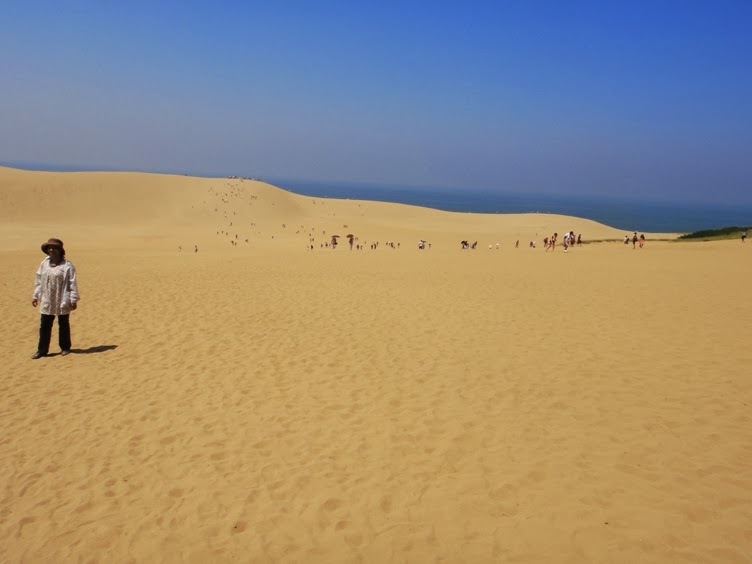 However during summer, the temperatures in the sand dunes can rise up to 60 degrees Celsius. 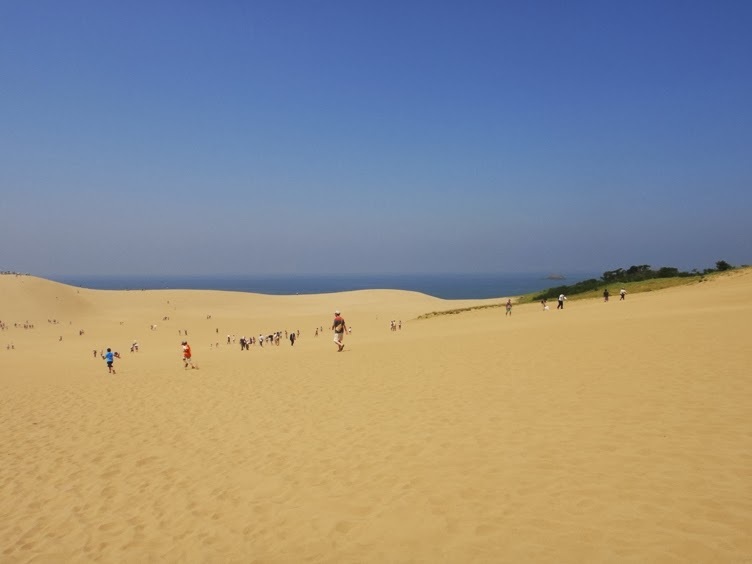 These sand dunes are part of Sanin Kaigan National Park, and have been designated as a Natural Monument of Japan. 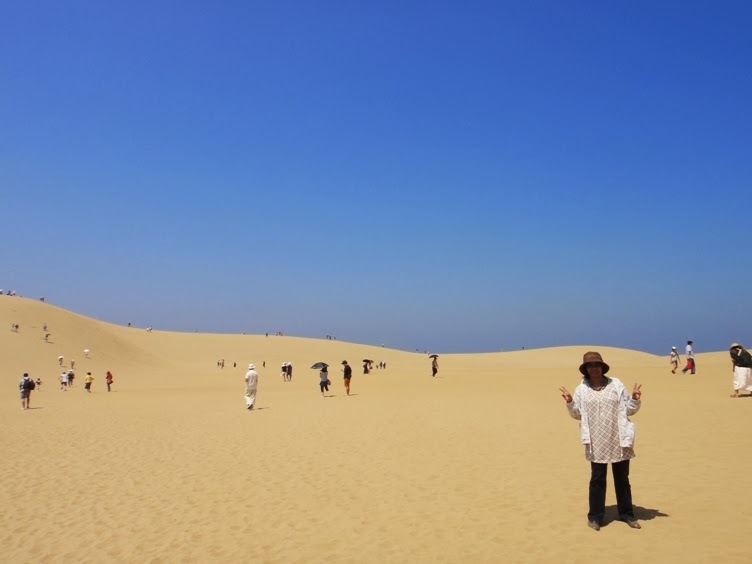 Tottori Sand Dunes are magnificent artwork created by nature over 100000 years ago. The dunes were created by sediment deposits carried from Chugoku Mountains by Sendaigawa River into the Sea of Japan. 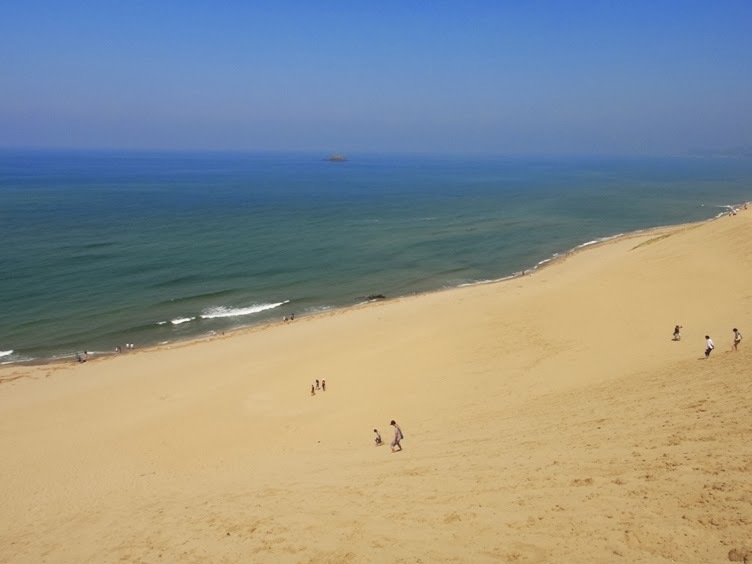 Eventually, sea currents and wind brought the sand from the bottom of the sea onto the shore, which gradually accumulated and re-deposited along the coast over a long period of time. 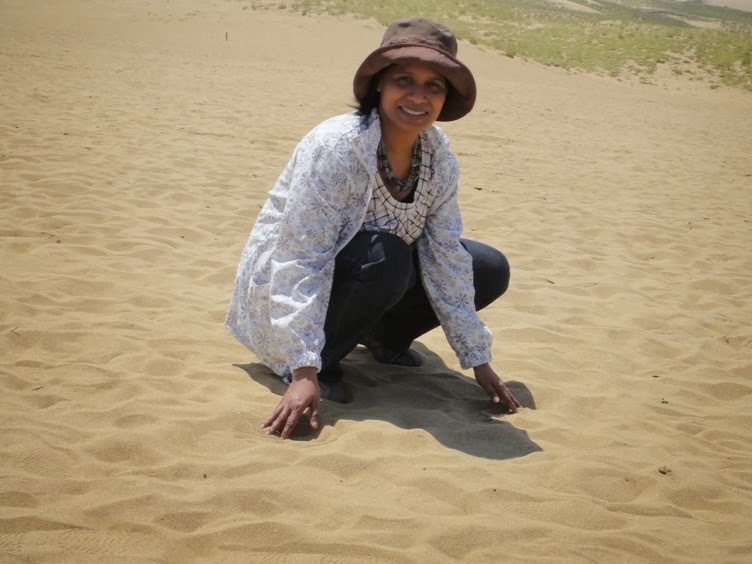 And as a result, the sand dunes were formed. Today, the constant movement of the tides and the strong coastal winds continuously rearranges the shape of the sand deposits and create incredible desert-like formations. At times, 40 meters deep basins, 50 meters tall hills, wind ripples, and sand sliding down the surface of the hills like an avalanche can be seen. 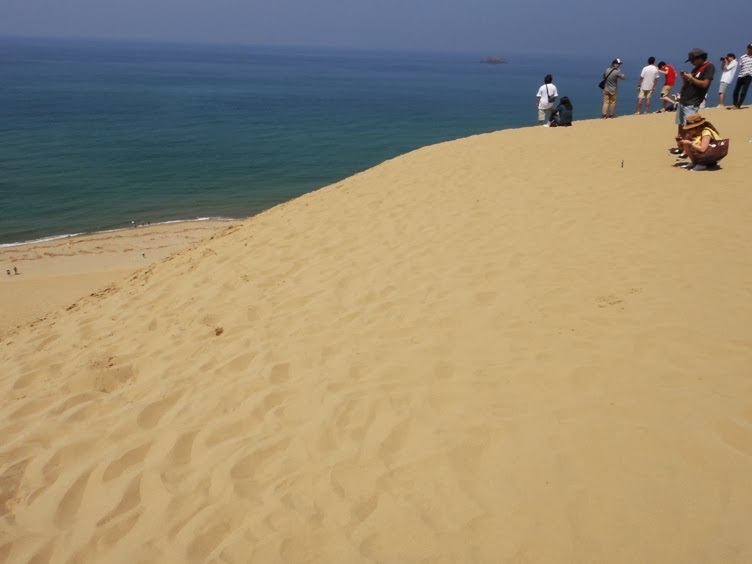 The highest dunes reach around 90 meters above sea level, and because of the rains they can have slope of up to 40 degrees steep. 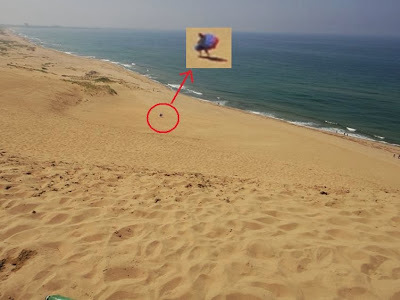 The best time to view the sand dunes is early in the morning before other tourists track up or trample the sand. We can see the beautiful wind ripples and other unique patterns carved by the wind. 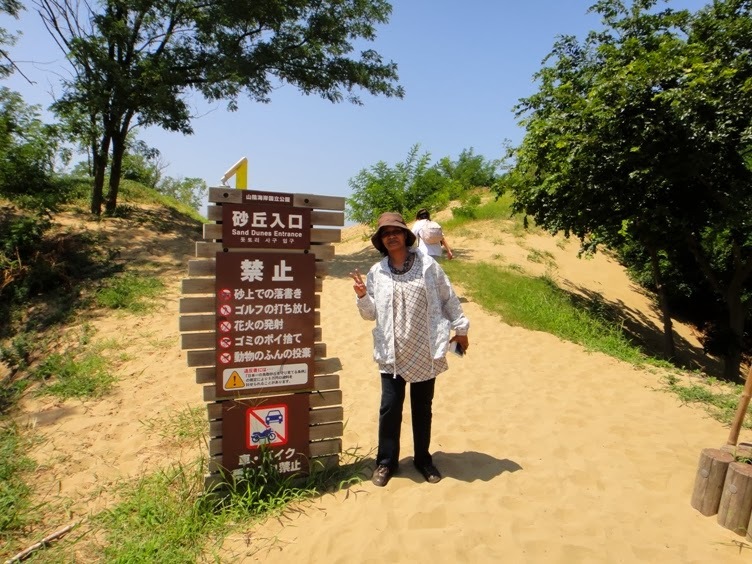 It is unfortunate that the area of the sand dunes is steadily shrinking due to a government reforestation program after World War II. 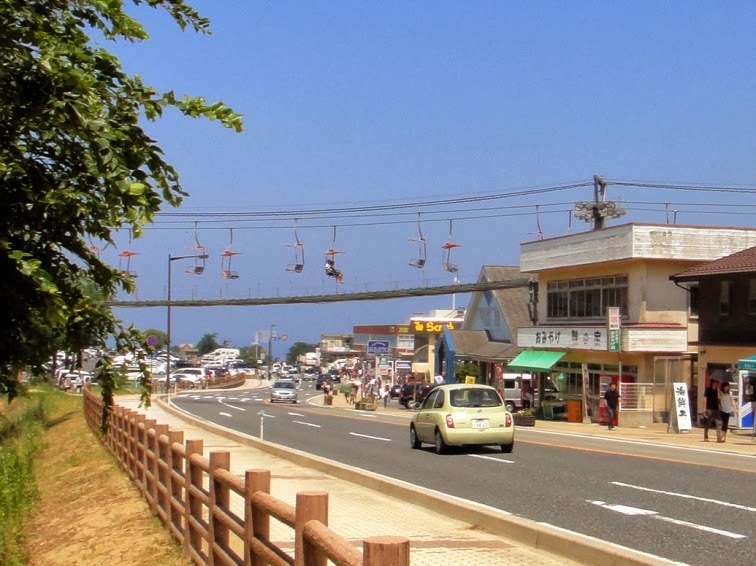 In addition, concrete barriers erected to protect the coasts from Tsunami have disrupted the sea current responsible for bringing the sand to the shore. Encroaching weeds and patches of crabgrass keep sand from moving freely and the sand ripples from forming. 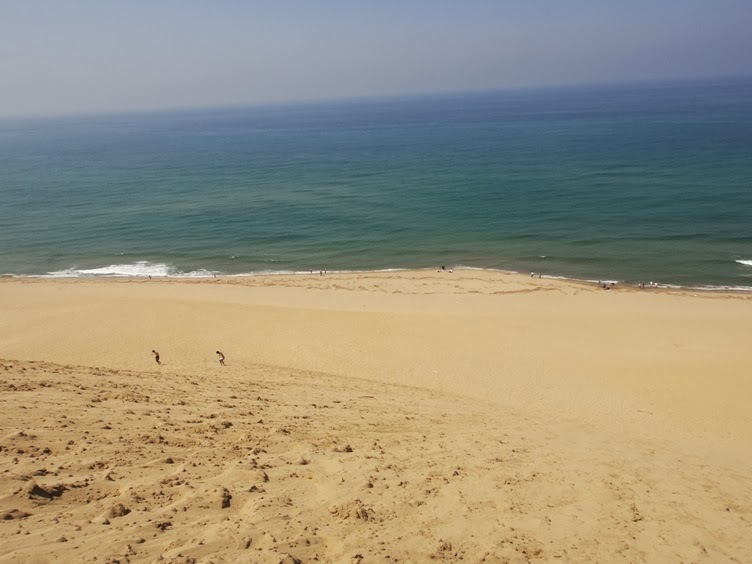 Recently local government has adopted several measures to stop the shrinkage of the dunes. The main sightseeing area at the sand dunes spans about half a kilometer between the visitor center and the sea coast. 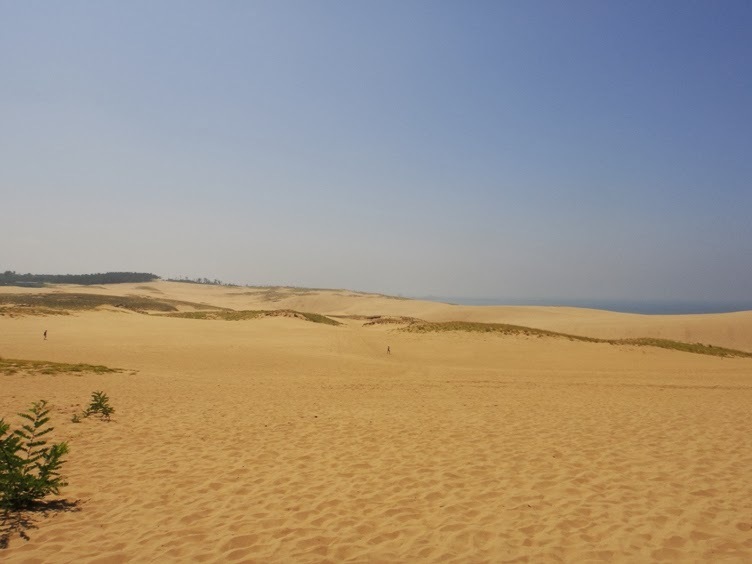 Many of the largest sand dunes are found here, and their tops provide visitors with beautiful views out over the coast. 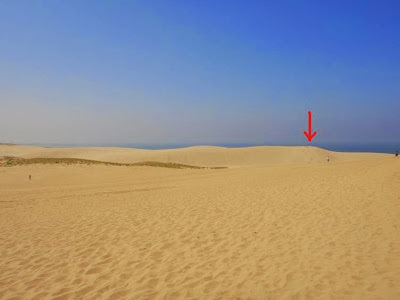 The place can be nicely explored by climbing up the dunes. There are also a number of other attractions to enjoy around the dunes. A tour on the back of a camel or in a horse drawn cart can be very interesting. 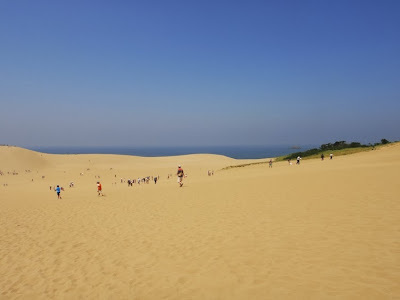 In addition, the dunes can also be enjoyed from Dune Observatory Center, which is connected with the sand dunes by a chair lift. 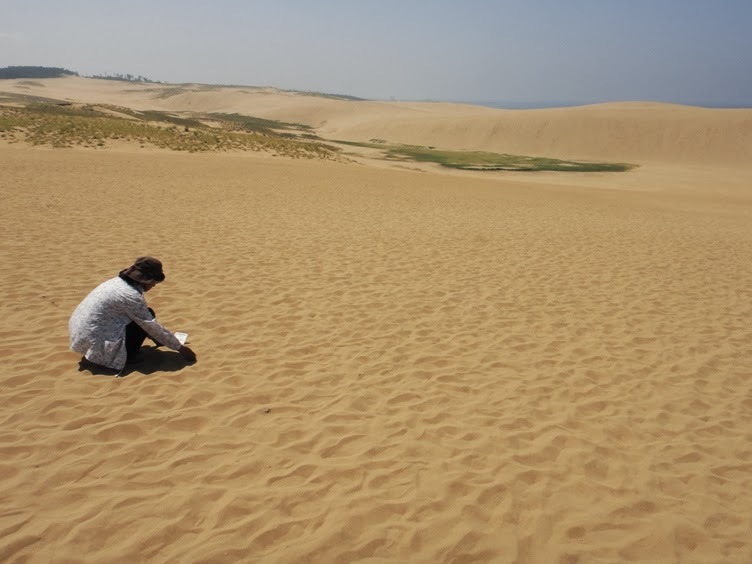 In addition, adventurous activities like paragliding and sand-boarding opportunities are also available. 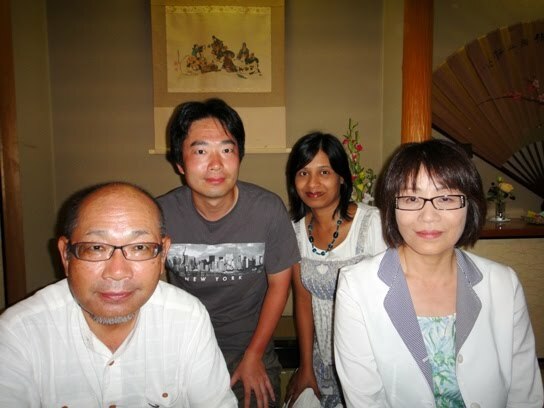 On August 12th, first we visited Amanohashidate Chionji Temple in Miyazu City of Kyoto prefecture. 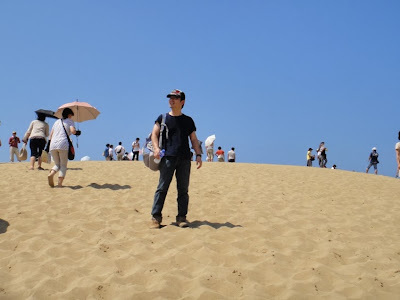 After that we visited Tottori Sand dunes in Tottori City. 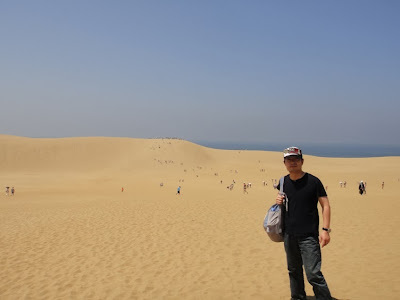 The sand dunes are located about 120 kilometers west of Chionji Temple, and it took us about 2 hours and 30 minutes of car ride to reach the sand dunes. We parked our car at the parking area of a souvenir shop. 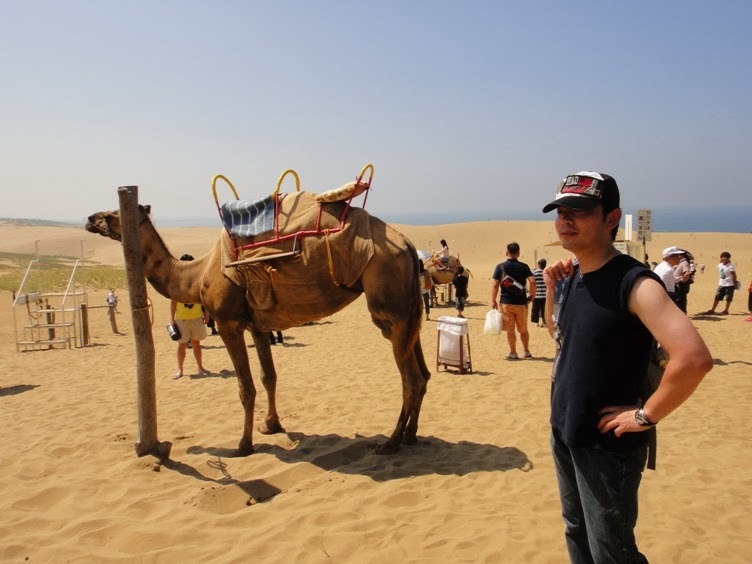 This souvenir shop is located right in front of one of the southern entrances to the sand dunes. 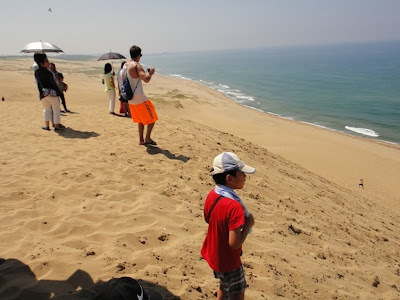 At the entrance area, about 100 meters to our right side, we saw chair lift that took visitors right above the sand dunes. However, we decided to walk on the sand dunes. After passing through the entrance area, we were surrounded by sand all around us. That area was more or less flat but we found it a bit difficult to walk. This is probably because we were walking on the sand for the first time. 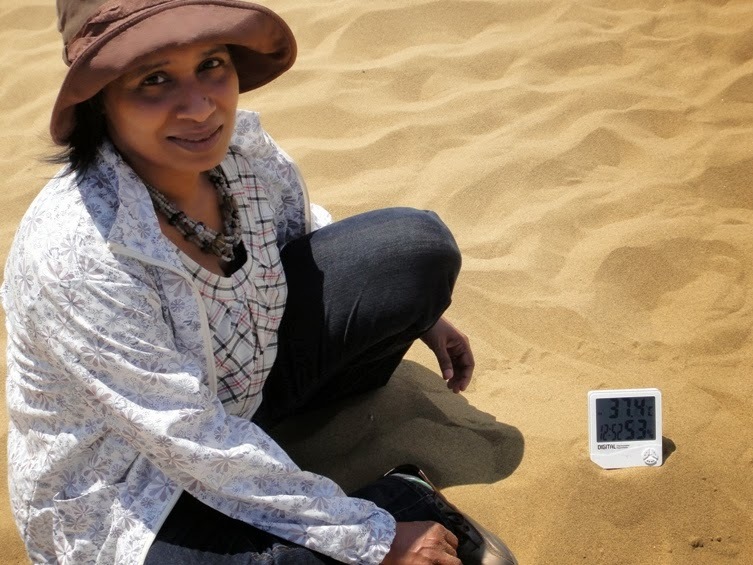 It took us some time to get used to, but we soon realized that walking on the sand was actually fun. 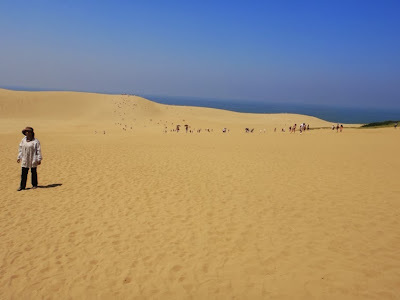 As I have mentioned earlier, the main sightseeing area of the sand dunes spans about 2 kilometers from east to west and are about 0.5 kilometers wide from north to south. 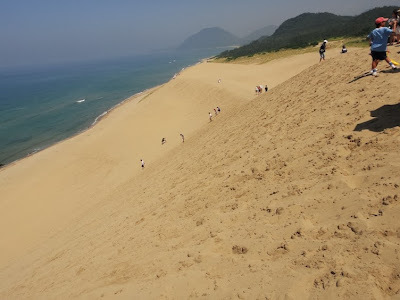 We entered the area from the south and aimed to climb one of the tallest hills of the sand dunes located towards the northern end. We started walking towards the north and it seemed almost surreal to see the sand dunes spread out in front of us like a real desert. 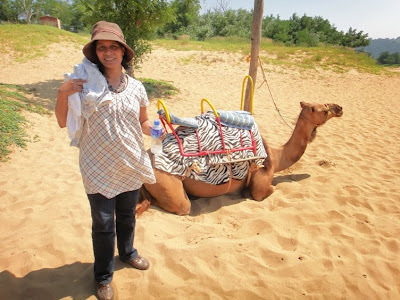 After walking for several tens of meters, we saw a few camels to our right side. 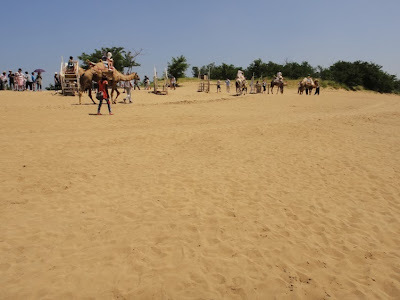 Many people were enjoying the camel rides and touring the sand dunes. View of the sand dunes right in front of us. We aimed to climb the hill marked with red arrow. 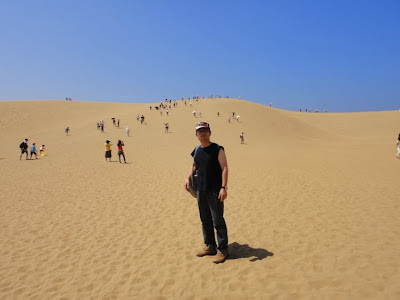 After about five minutes of walking on the flat area of the sand, we started getting the feeling that we were climbing uphill although the area still seemed more or less flat to our eyes. 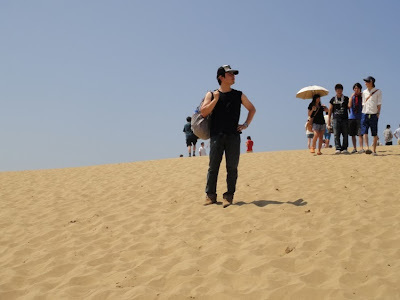 After walking for just five minutes on such an uphill area, we already started feeling a bit tired and could actually feel our muscles working harder walking on the sand. So we slowed down our pace of walking a bit. 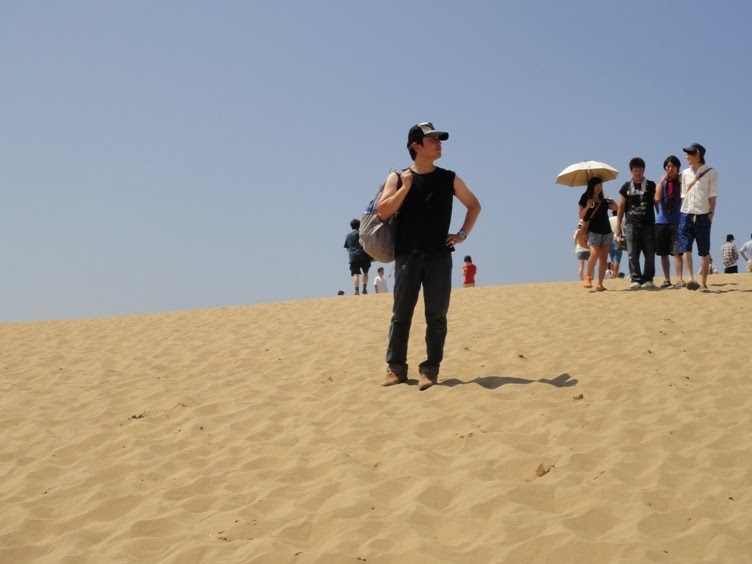 We were walking on the sand at about 1 pm in the afternoon of a very bright sunny day during peak summer time. It was blazing hot but it was still fun to walk on the boiling hot (felt like that) sand dunes. 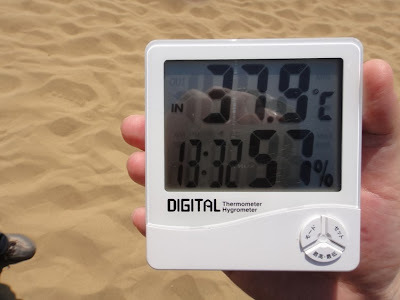 I had a digital thermometer with me and tried to check the temperature of the sand but it was just 37.4 degrees Celsius. 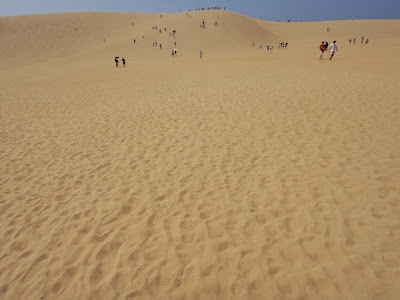 I read in a sightseeing pamphlet that the temperature in the sand dunes can rise up to 60 degrees Celsius, and I am wondering how it would feel like walking on such hot sand. 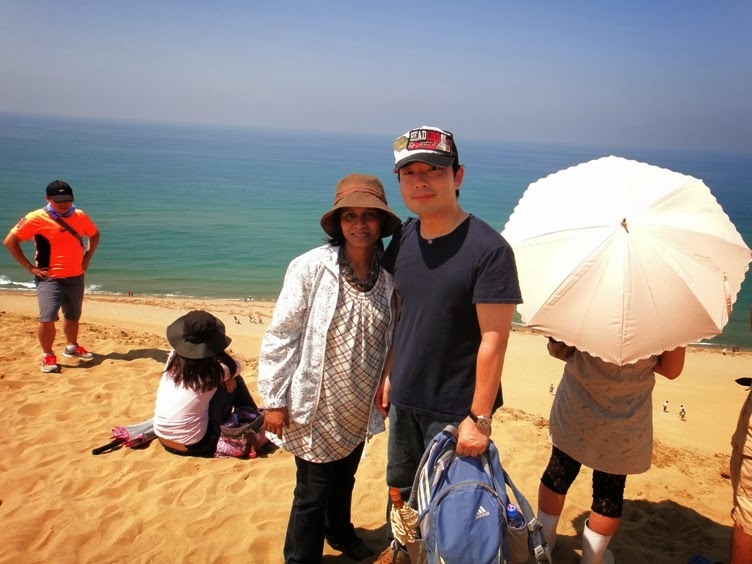 After walking uphill on the sand for another five minutes, we took rest for some time. 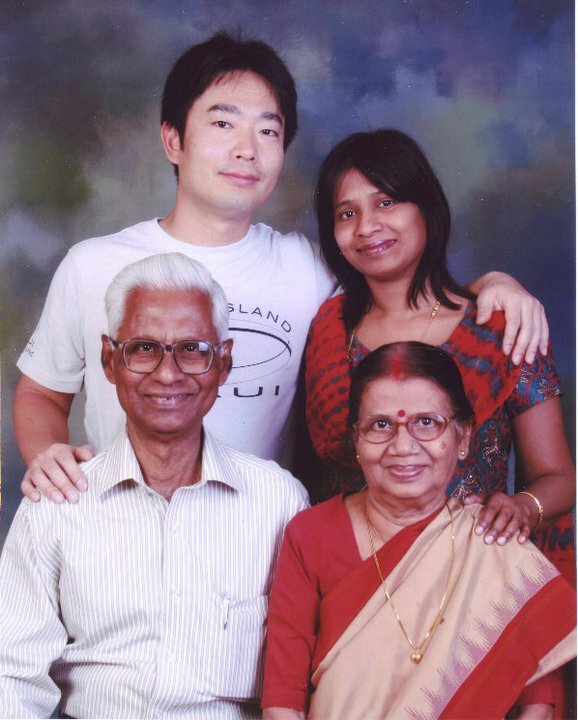 We clicked a few photos of us for the sake of memory. 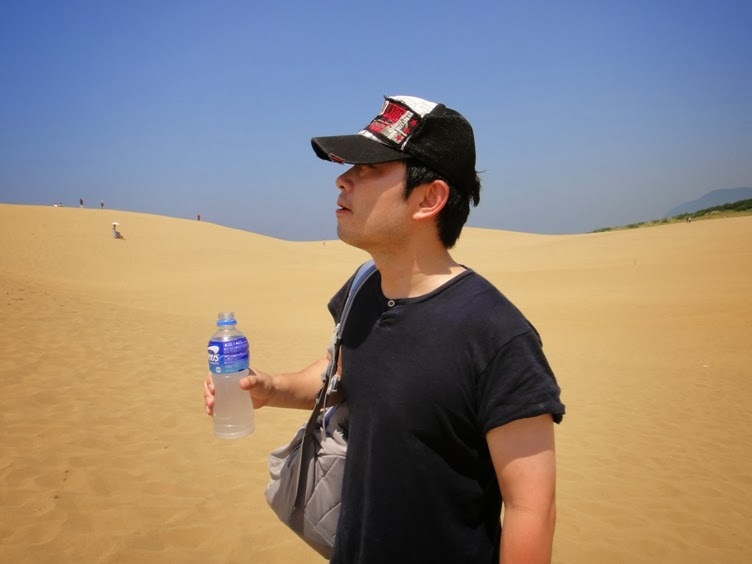 While taking rest, I realized that it was a summer afternoon during the peak holiday season in Japan (Obon holidays). 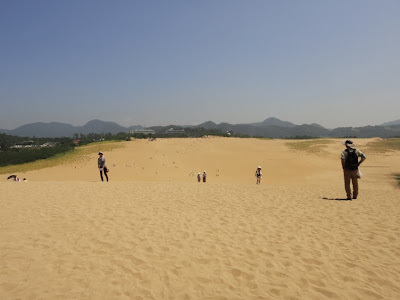 From early morning onwards, many tourists had started visiting the sand dunes that day. 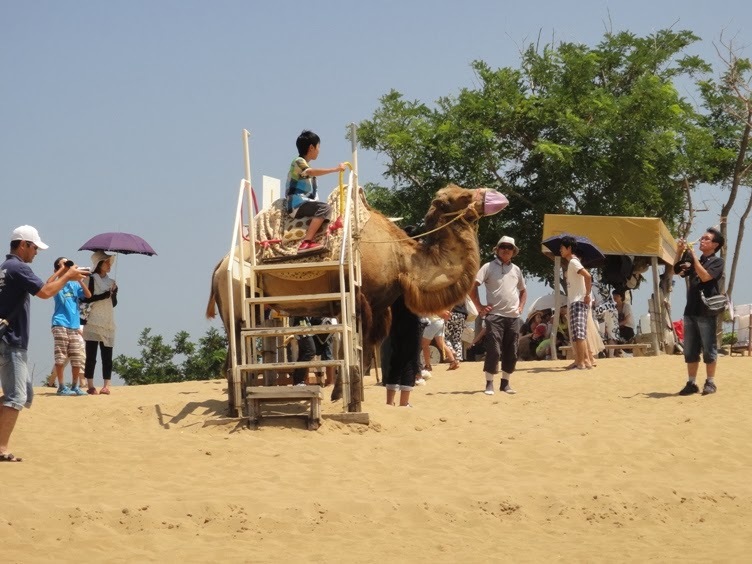 So as I expected, the tourists had completely tracked up or trampled on the sand. And there were no beautiful wind ripples or other unique patterns carved by the wind for us to see. Nonetheless, the sand dunes were still impressive and magnificent. 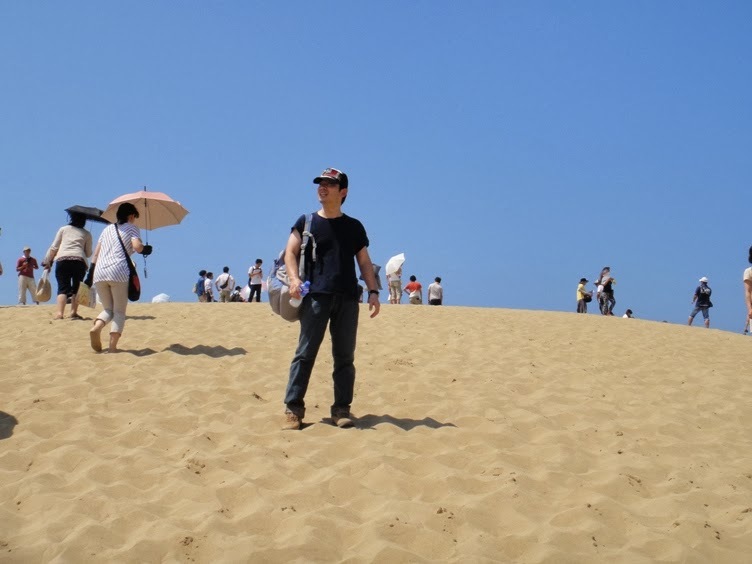 While walking on the sand further up the hill on such a hot summer afternoon, we realized that how easily we can get tired. Hubby was sweating a lot. So after another five minutes of walking, we again took rest for some time and drank a sports drink to keep ourselves hydrated. From this point where we rested, the highest hill of the sand dunes and other surrounding hills could be clearly seen, and it was truly a spectacular sight to behold. Feeling refreshed after taking rest for a couple of minutes, we put all our energy into climbing up to the top of the highest hill. These last five minutes of walking on the sand up the steep incline of the highest hill was the most difficult part. In fact, it felt like quite an achievement to reach the top of the highest hill. 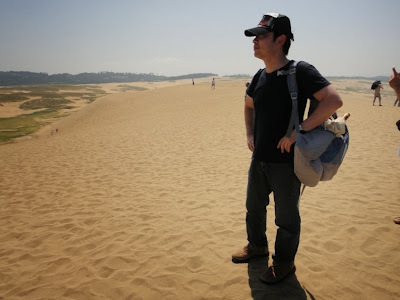 Conquering the sand dunes took a lot of strength but it was worth it. Everything seemed so impressive and magnificent from the top of the hill. 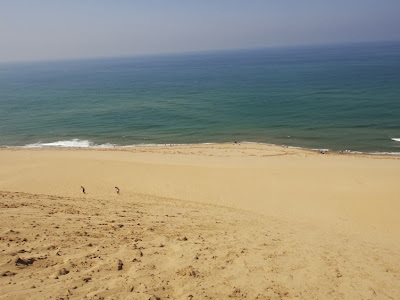 Standing at the top, I realized that it had taken us about 35 minutes of walking, resting, and climbing uphill to reach the top of the sand dunes. 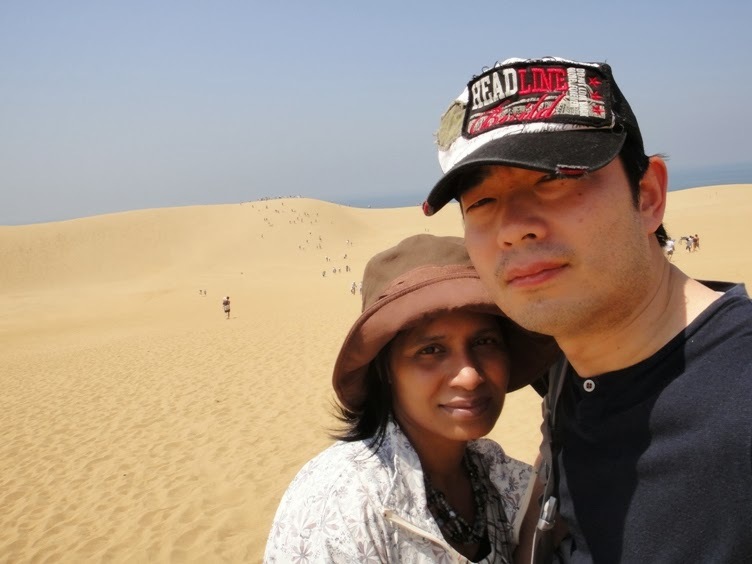 Standing at the top of the highest hill of the sand dunes, we felt a sense of freedom and oneness with nature. Looking eastward, westward, and southward from the top of the hill, the landscape of the sand dunes looked desert-like and we could see vast expanses of sand in almost every direction. But looking northward from the hilltop shattered the illusion of being in a desert as we saw the Sea of Japan spread in front of us. The sea by itself looked superb and enchanting, and we felt the cool breeze coming from the sea. The blue waters and crushing waves of the sea seemed to call us down from the slopes. 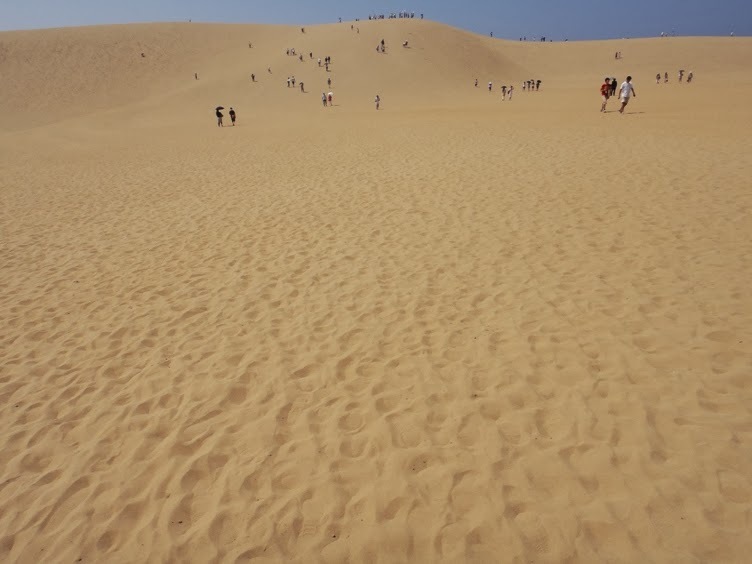 But we resisted the temptation as it would have been too bothersome to walk on the sand for another hour in such hot weather conditions. 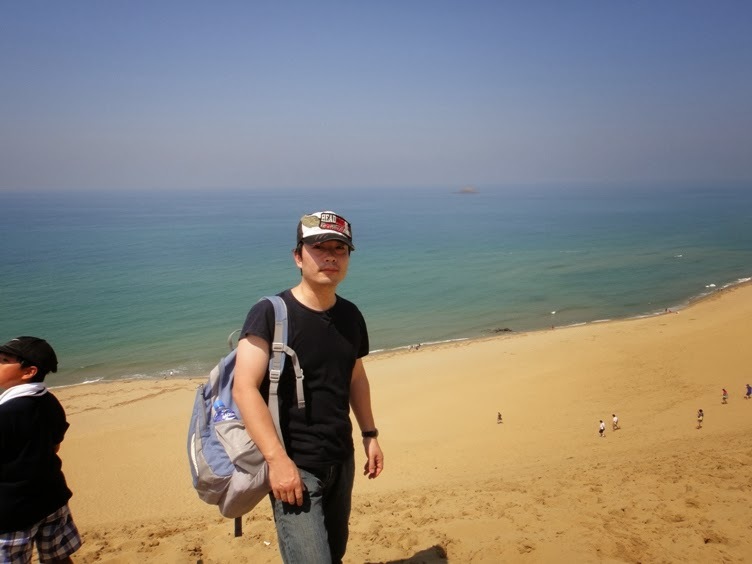 Anyway, we thoroughly enjoyed the boundless view of sea and sand. 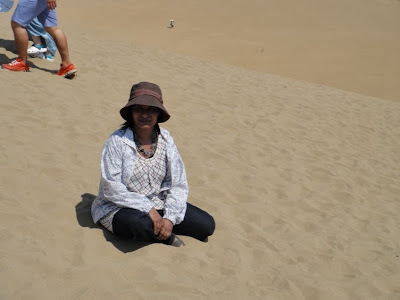 We stayed at the top of the highest hill of the sand dunes for about ten minutes. But then it was time to go back down the hill again. It was quite a strain and hubby seemed rather unwilling. We went a little offside towards the west, and started walking down the hill. On our way, we saw a few people paragliding down the slopes. Hubby joked that we should also do the same. But unfortunately, we are not into any kind of adventure sports activities. While walking down the hill, we noted that crowds of young people were speed-running down the sandy slope. 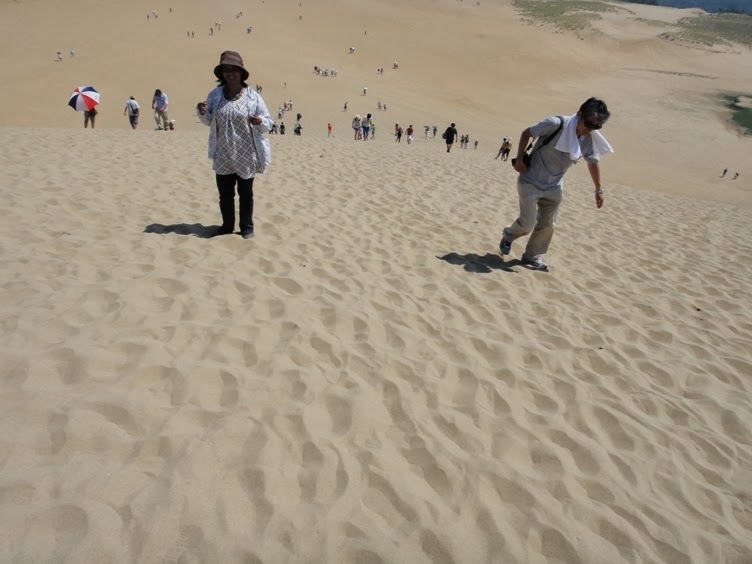 We also followed their example, but midway down the slope my shoes were filled with boiling hot sand because of running down the hill. 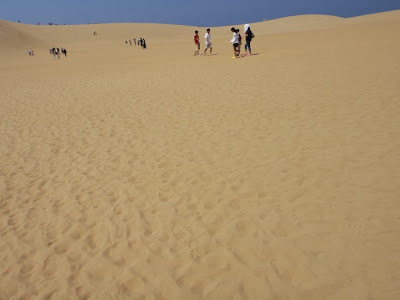 The scorching hot weather and the sizzling hot sand in my shoes made me dizzy but somehow I did not faint. 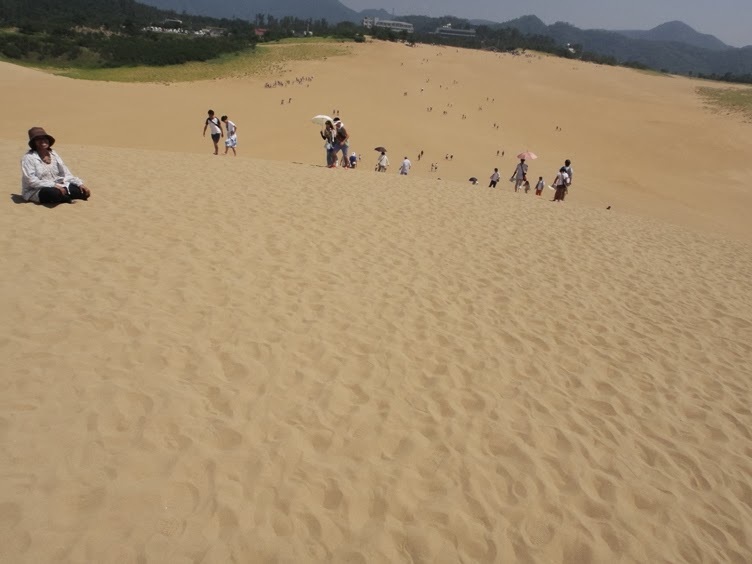 We reached the bottom of the highest hill of the sand dunes in just eight minutes. We walked for another couple of minutes on the flat area of the sand near the southern end, and turned around to click final few photos of the sand dunes. 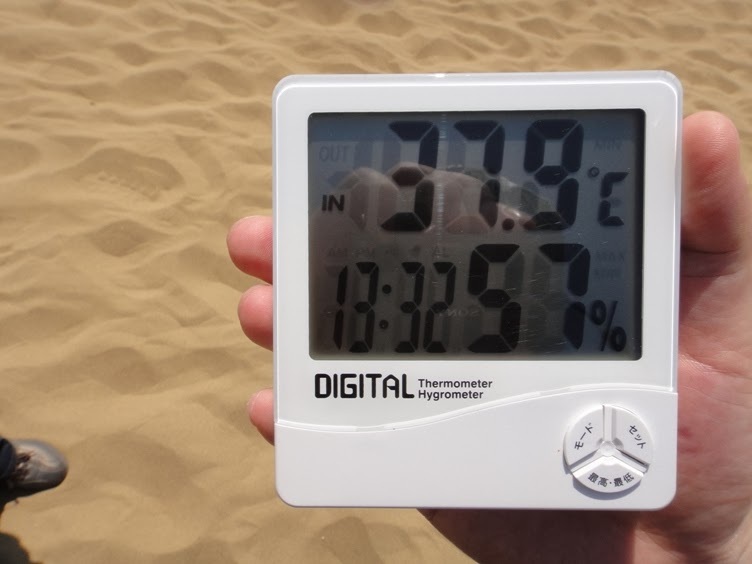 Our digital thermometer indicated that the temperature had risen by just 0.5 degrees Celsius in the past fifty minutes. 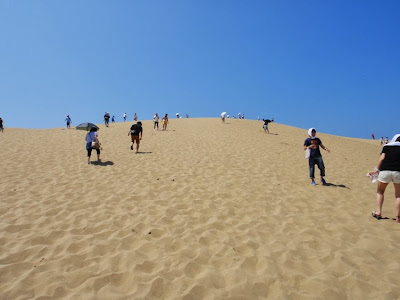 However, because of all the walking, climbing, and running on the hot sand, we felt the apparent temperature to be much higher. After enjoying walking on the hot sand of the dunes, we walked up to the camel riding zone and took rest under the shade of a tree for some time. We clicked a few photos of us with the camels. 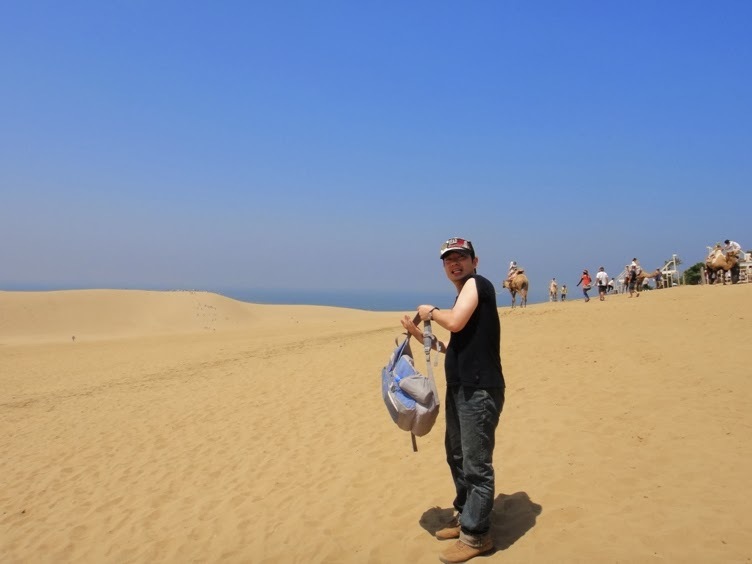 Afterwards we left the sand dunes, and went to a souvenir shop located right in front of one of the southern entrances of the sand dunes. 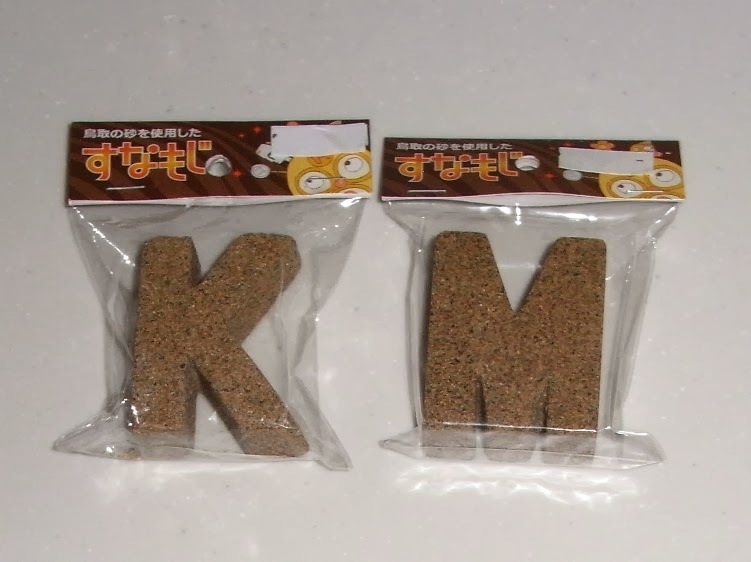 We bought cute sand models of letters ‘K’ and ‘M’ which represent the first letters of hubby’s (Kazuo) and my (Manisha) first name. Hubby and I really enjoyed visiting Tottori Sand Dunes. The sand dunes seemed like a mini-desert and I imagined that we were walking in the Arabian Desert. It was a nice and unique experience. In the evening we visited Hakuto Shrine in Tottori City itself. I will write about it in the next post.